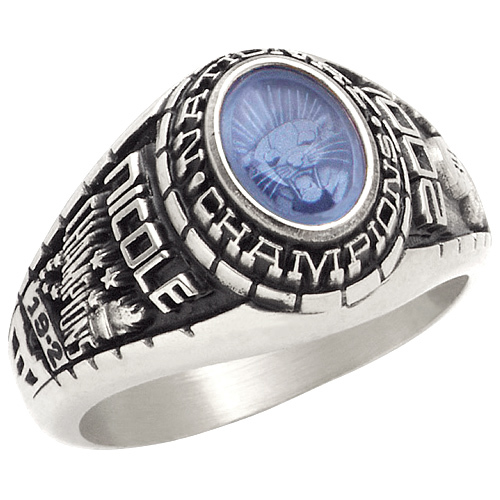 The ladies' Desire championship ring has a 8mm x 6mm oval simulated stone and is made of white lazon. Solid back ring is made in the USA by Gold Lance. Choose the wording around the stone, along with side emblems and engravings. Enjoy Gold Lance's limited lifetime warranty. Click on an image to select a stone cut. If available, more options will appear below. Choose a simulated birthstone below. The color of each stone displayed is approximate. Actual stone colors may vary. Choose your emblem and the engraving options for that emblem will appear below. Enter your first name or 4 digit graduation year. Backdates are available for an additional $20. Numerals or capital letters only.